The Vilar Performing Arts Center was alive with toe tapping, knee smacking and head bobbing this week, as Tony Gulizia and the Vail Jazz Goes to School Sextet performed a trio of concerts for local fourth- and fifth-graders to wrap up the latest season of the Vail Jazz Foundation’s Jazz Goes to School program. 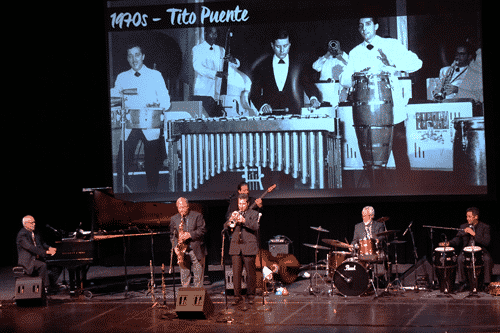 Gulizia took students on a historical tour of jazz, from the funeral dirges of early 1900s New Orleans, through Fats Waller and Duke Ellington in the 1920s and ’30s, hitting a crescendo with Dizzy Gillespie’s 1940s be-bop — complete with three-conch shell harmony — and then dialing it back with the “cool jazz” of Miles Davis in the 1950s. 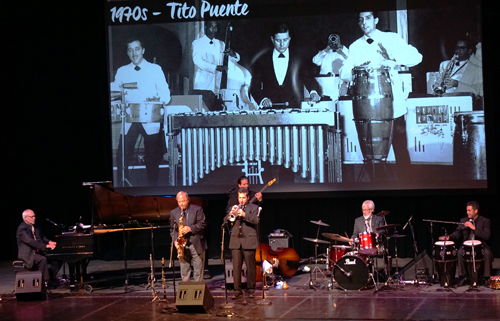 The Sextet strolled through Herbie Hancock’s “Cantaloupe Island,” sizzled on Tito Puente’s “Oye Como Va” and jammed on Grover Washington Jr.’s pop classic “Just the Two of Us,” as the young audience clapped along, occasionally air drumming or throwing up a finger trumpet, cheeks puffed out like Gillespie. Decade by decade, Gulizia introduced the tunes with a bit of background about each style of jazz and each musician who helped to make it famous, from the first jazz song that was ever written down on paper — W.C. Handy’s “The Saint Louis Blues” — to the heyday of New York’s Cotton Club to the advent of electronic instruments in the 1960s. The tour came to an end with Louis Prima’s rendition of “Jump, Jive and Wail,” part of the resurgence of swing in the 1990s. As a new edition to the program this year, fifth-graders who participated in Vail Jazz Goes to School were challenged to write their own lyrics in sync with the jazz chord progression they had learned known as the 12-bar blues. Gulizia and his fellow musicians concluded each of the three performances by playing a handful of the submitted tunes and, ultimately, crowning a trio of winning songs, rewarding the songwriters with gift cards to Sugar Bar candy store in Edwards. He sang of run-away dogs, the cool, clear water of a summer swimming pool and making lemonade when life gives you lemons before launching into the first winning composition on Tuesday morning. Excited murmurings shot through the crowd as Faith Sandoval, a fifth-grader at June Creek Elementary, recognized her song, embellished by Gulizia’s blues crooning. After learning about the 12-bar blues, and the potential reward of a sweet treat for winning the competition, Faith said she was inspired to write on the theme of candy. “I really like making up beats of songs, and what made me think of the candy, I really wanted to inspire little kids to keep on going to do this,” she said. Tuesday afternoon brought a songwriting duo to the stage to collect their winnings. Maddox Fitzgerald and Keegan Collins, of Edwards Elementary School, wrote their song “Home Run” about America’s favorite pastime. Keegan said he was speechless when he heard Gulizia sing the first few lines.